Now lately, if you see me in a scarf you can bet I've been to the boot sale. For some reason, all the bootys are incredibly dusty and with the days so windy a scarf has been a must accessory for over there. 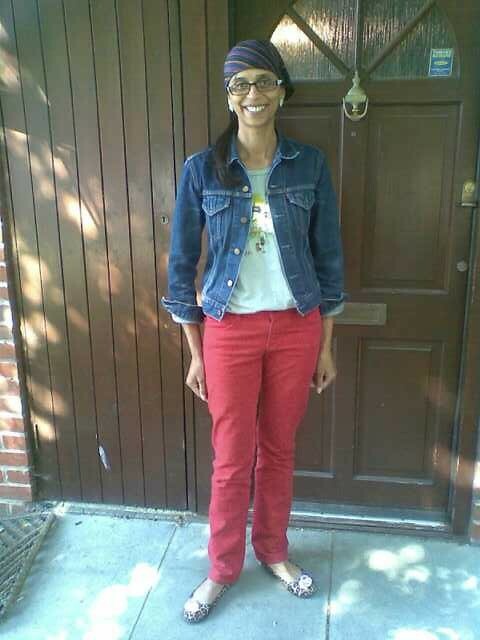 My outfit is my thrifted H&M red jeans from the boot sale in Brentwood a couple of months ago for only £2. My Levis jacket was also only £2 from the boot sale last month and has been worn quite regularly since. I'm also wearing my Uniqlo Jean Michel Basquiat tee which I bought a couple of years ago. I quite like double denim, hence my second most recent post featuring it!! Will you work double denim this season? I love double denim- I usually go with deliberately mismatched colours like in your outfit, but I do have a blazer and jeans that I match 'exactly' for a slightly preppy, nautical feel. Yet again another stylish and bargain outfit. I shall definatley be rocking double denim, infect I already have. I'm impressed. You're so good at finding a fashion bargain. I'm loving my red jeans - haven't worn them with a denim jacket yet but I like this look. (I just commented on double denim in one of your other posts....). What I'm REALLY liking right now are your scarves! I do wear double denim as often as I can. It's just comfortable and easy to style. Really like your red jeans, I think color denim is very cool. 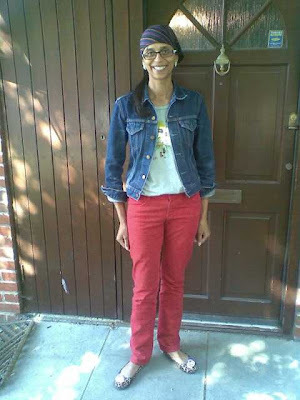 LOVE your red jeans! And I love a headscarf. You look gorgeous, amor! 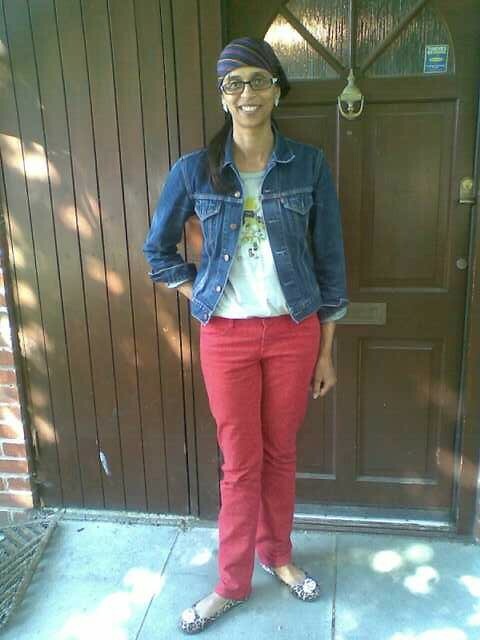 Probably no double denim for me but I'm seriously thinking of investing in a pair of red jeans. They look great on you. I love the denim look on you. I don't know if I'll try it.